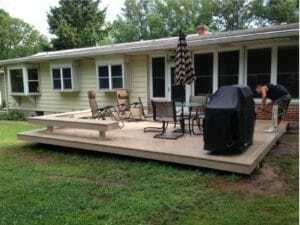 Blog - Harmony Decking - Building Decks in Bucks, Montgomery County & Beyond! 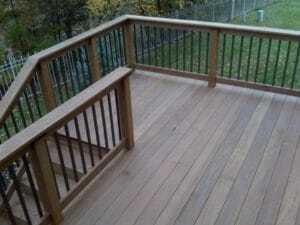 Read about our decking services in Bucks County, Montgomery County & beyond! Most people feel the backyard loses its luster once summer months come to an end. But here in the Northeast, fall brings more temperate weather to build, maintain, and relax in. This time of year is still perfect to enjoy the sunny days or to take in the cooler nights on your deck . After a long, hot summer of steady use, your current deck is probably ready for a fresh coat of paint or wood stain. With cooler temperatures around the corner, it’s a great time to do some basic prep and maintenance on your deck. But if your deck needs more than a little TLC to bring it back to life or if you’re thinking of building a new deck, Harmony Decking is up for the job. Check out these three reasons why fall is a foolproof time to turn your dream deck into reality. More predictable weather: Let’s face it: Summer is primetime to enjoy the outdoors for barbecues and pool parties. But with unexpected thunderstorms and heat waves, summer is not always the friendliest when it comes to enjoying the outdoors. In September and October, temperatures and weather patterns are typically ideal for enjoying the outdoors and building outdoor structures without delays caused by weather. Less Disruptive Construction: With summertime activities wound down and fall activities, festivals, and sports taking up the calendar, fall is a great time to build simply because most people DON’T utilize their own yards as much. That means that any building you choose to do won’t limit your use of the backyard in the summer. At Harmony Decking, our goal is to help you live in harmony with your own outdoor living space. Combined, we have over 30 years of experience. Let us help you plan your fall deck now. 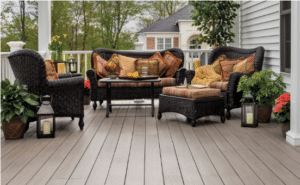 Call Harmony Decking at 215-290-7727 today! Your deck is perfect for spending summer days outside. But what about summer nights? Maybe you’re lacking enough outdoor lighting to keep reading your book after the sun goes down, or maybe you find yourself constantly swatting at mosquitos. At Harmony Decking, we want to make sure that our customers can enjoy their outdoor living spaces to the fullest, even after sunset. 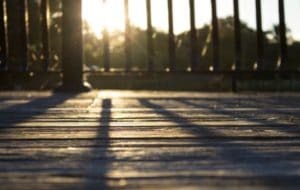 Fortunately, you can make some easy modifications to your deck that will allow you to maximize its enjoyment potential on those warm summer evenings. Here are some simple tips for how to enjoy your deck at night. Add deck lighting. 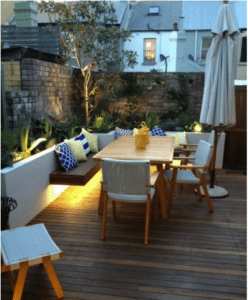 Deck lighting can be both beautiful and practical, and there are so many options that compliment the design of your deck. Add accent lights, in-deck lights, riser lights, rail lights, and cap lights to create a warm glow that will make your deck safer to navigate and provide enough light to keep the party going. Keep mosquitos away. 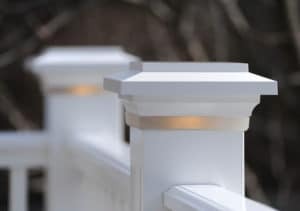 Mosquitos and other flying insects can be a real nuisance at night, and also happen to be attracted to the lighting (and the people) on your deck. Wearing bug spray 24/7 isn’t ideal. Luckily, a light wind is a very effective natural repellant, so a simple fix is to install a fan or two. If you don’t like feeling the breeze, you can try decorating your deck with potted plants that are known to repel mosquitoes (such as marigolds, catnip, and lavender). Make sure to eliminate sources of standing water, such as birdbaths, so the mosquitoes will have fewer places to lay their eggs. Make it warm and cozy. Even during the summer, nights can get a little chilly. Consider having some cozy blankets stored nearby for you and your guests–look for benches and other deck furniture that contain built-in storage space. You can also consider installing a heat lamp or propane patio heater. A patio heater is an attractive addition to your deck that can also kick out some serious warmth, allowing you to enjoy your deck at night and as the weather gets cooler. Summer isn’t over yet–there’s still time to make improvements to your deck while the weather is warm! At Harmony Decking, we’re ready to help you choose deck design and lighting options that will help you enjoy your deck all day long and all year round. Contact us to talk about how our experienced and friendly professionals can get the job done right. Inspect your deck. Pennsylvania is subject to some extreme weather. From heavy snow to hot and humid summer days, your deck will see it all. All that moisture and sun will deteriorate your deck over time, so it’s important to fix small problems before they become major. Inspect your deck for issues like dry rot, protruding nails or loose boards. It’s not a bad idea to grab a flashlight and check or these issues underneath your deck, too. Clean it up. While sweeping your deck will keep it looking nice, a thorough cleaning from time to time will go a long way. Make sure to select a cleaning product appropriate for whatever material your deck is made of. Wood and composite cleaners will not only freshen up your deck; they’ll prevent moss and mold from growing and deteriorating your deck. Sand, stain, and seal the wood. While this doesn’t need to happen every year, it’s a good idea to do a little more work from time to time. Some deck-sealing products have wax additives which will cause water to bead. These are great products, but work for a shorter period of time. Staining your deck will protect the wood even after that wax has worn off. We recommend doing both. Sometimes you can stain and seal your deck without sanding it. But if you sand your deck, make sure to stain and seal it afterwards. If you don’t, you’ll be leaving it open to the elements. Your deck shouldn’t be a burden. It’s your space to enjoy time with your friends and family, to cook a delicious meal, and share a few cocktails. 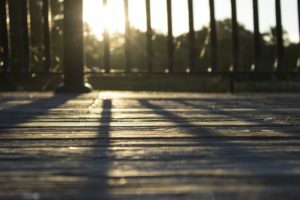 While some people love the ritual of preparing their deck for summer, there are probably a few readers dreading the idea of cleaning and sealing their decks. If you need some help maintaining your deck or have questions about building a new one, give us a call or send us an email. For more tips, see our blog post about choosing the type of deck right for you! Which Type of Deck Should you Choose? Memorial Day Weekend has come and gone and the season for entertaining outside is officially upon us! Are you someone who likes to host a big party? Do you envision BBQs and lawn games or quiet, candlelit outdoor dinners? No matter your style, there’s a deck for you, and as the official deck experts in Montgomery County, PA, we’ll help you find it! A traditional or classic deck is perfect for relaxing with the family, chatting with friends in the summer or lounging with a good book. This style is hallmarked by wicker or teak wood and warm, comfortable cushions—usually striped, floral or traditional colors. There’s something nostalgic about this style; choose this classic look for ultimate comfort. Feel like your backyard should make a statement? You’ll want this contemporary deck with all of its modern furniture, bright color combinations and interesting, geometric shapes. We love all of the options out there for materials and decor: plastic, aluminum, low-luster metals, etc. We also love to see how our clients combine them! Don’t forget that lighting can play a big part in giving your deck a contemporary feel, and so can adding trendy succulents or greenery! A deck with a vintage country vibe is the perfect place to gather with friends for a 5-star home-cooked meal. Repurpose containers for potted plants and grab an eclectic mix of seating and you’re halfway to a beautifully rustic-looking deck. For the furniture, we recommend aged or refurbished woods or metals mixed with soft vintage colors and the occasional bright bold ones. Add whimsy wherever possible! This one is a no-brainer if you’re decorating a deck for your beach, lake or pool house! It’s also one of the easiest styles to pull off. Pale blues and yellows mixed with off-white will go swimmingly with beach-themed decor like rope, shells, driftwood, and corals. In fact, there’s so much possibility with this look, your biggest challenge will be not to overdo it! Spring cleaning isn’t just for your home and garage. It’s a great time to spruce up your deck, not only to get it ready for warm-weather festivities, but to ensure it’s in top condition and well maintained. This month, we’ll discuss spring deck maintenance tips, as well as a few cool ideas to bring some new life to your outdoor space! Remove objects. You should have cleared off any furniture, plant pots, grills, etc. before winter. If you did, great! If not, do so now. Clear debris. Once your deck is clear of all objects, it’s time to clean it well. First, sweep away any debris like leaves and twigs. These not only look messy, but can leave unsightly stains if left too long. Wash. Now that you have a clear surface free of debris, it’s time to wash the surface. If you have a pressure washer, use it. If not, the hose and an outdoor broom should do the trick. When using a pressure washer, be sure to keep the water stream moving so as not to accidentally gouge the wood. Allow the deck to dry thoroughly overnight. Fix loose nails or “nail pops.” If you notice a loose board, use a hammer or cat’s paw to pry out the nail. Then, use a screw that’s longer than the nail to reattach the board. Repair split wood. If you have one or two boards that are split down the middle, you can consider repairing them yourself. If there are multiple split boards, however, we suggest you call us to help with the repair. Stain and seal. Even if you have pressure-treated wood, it’s still susceptible to UV damage from the sun, and decay after years of use. Best practice is to stain and seal your wood as needed to extend its life, and keep it looking beautiful for years to come. 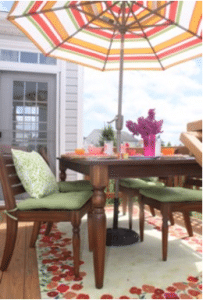 Bring Spring Cheer to Your Clean Deck! Add a splash of color. Accent walls aren’t just for home interiors. Consider painting part of your deck or a side wall a beautiful color. Functional furniture. Do you enjoy spending time having meals or just hanging with friends and family on the deck? Try adding some comfortable seating and a table. You’ll transform your deck into a beautiful outdoor living space. Plants. Potted plants, hanging plants, even a raised box garden are fabulous ways to spruce up your garden for spring. In addition to flowers, you can even grow some vegetables like tomatoes and peppers! You’ve decided to build a deck, and now you need to get ideas for how to design it. In theory, a deck can be almost any shape. You’ll want to consider factors like how you plan to use your deck, the terrain of your property, layout of your home, and your budget. In practice, these are the constraints within which you must work to create the deck of your dreams. We’ve compiled a list of standard deck layouts to get you started thinking. Ground level decks – These are simple deck structures, usually placed on flat ground (though sometimes they can be put on a slope). They often don’t require any railing, and make a great breakfast space, entryway, outdoor mudroom, or patio. Raised decks – This is the most common type of deck, usually placed the first or on first or second level of the home. In many cases, raised decks offer outdoor access to upper level rooms. Raised decks always require a railing. Multi-level decks – Multi-level decks allow you to work around landscape obstacles such as slopes, unsuitable terrain, etc. You can also create separate spaces for different purposes. For example, a multi-level deck off of a kitchen can have a grill and dining area, and a separate seating area below–perfect for entertaining! You can even descend a hill in stages for different views. Multi-level decks are more complex to design and construct. 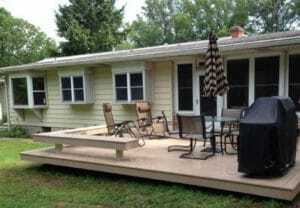 Wraparound decks – These are a popular option. They offer two or more entrances to the home, and shade and sun different times of day. Wraparound decks are also great for entertaining both large and small gatherings on the same space. Multiple decks – Creating more than one deck allows you to work around uneven terrain, and/or create a totally unique design. In many cases, a few small decks are often easier and less expensive to build than one large one. Harmony Decking makes it easy to build a quality deck for your home. We will help you through the entire process, and alleviate the stress that comes with making a home addition. If you have questions, please don’t hesitate to ask. You’re only one phone call away from building the deck you’ve always dreamed! From your morning coffee and a yoga session, to a summer barbecue and everything in between, a deck or patio can add value to your home and your quality of life. A deck can be the most multifunctional space in your home if you design it properly! 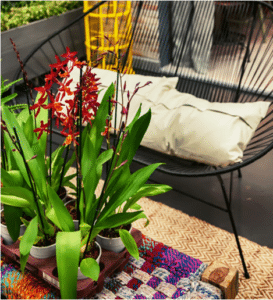 Whether you’re starting from scratch or just browsing for new ideas, here are four simple tips to transform your deck space into a multifunctional outdoor living space. Seating. Whether you prefer a full dining table, comfy lounge chairs, or a bare floor with yoga mats, your version of comfortable seating will transform your bare deck into a living area. Consider what kind of activities you’ll be doing on your deck, as well as how many people you want to comfortably accommodate, and choose a seating arrangement that best suits your needs. Umbrella/shade/weather protection. Like a fire pit, protection from the elements extends the amount of time you can comfortably spend on your deck. Consider table umbrellas or awnings and enjoy time outdoors rain or shine. You might even consider roll-up or retractable mosquito netting for those buggy summer mornings and evenings. Imagine unwinding with a cup of tea next to the fire under a soft rain. Heaven! Plants. Plants bring lively energy to any space, and they can be fun to care for too. There are dozens of options for plants, including potted plants, hanging plants, or a small vegetable garden. How about a garden that yields fresh summer salad ingredients to be enjoyed al fresco? On your deck, of course! The good news is that you can make your deck a beautiful outdoor area that reflects your interests and personal taste. With a bit of imagination and creativity, you’ll be enjoying days outdoors all year round! Harmony Decking is here to help you with your deck from start to finish. Have a particular idea that’s a little wild or unique? Ask us about it! We’ll custom design and build the deck of your dreams. Get some ideas from our photos! Winter is here, and we won’t see warm, sunny “deck weather” for at least a couple more months. You’ve invested in a beautiful outdoor living space for your home, but are relegated to using it six months a year. If you enjoy spending the colder weather outdoors, there’s no reason you can’t enjoy your deck in the winter. We’ve compiled a list of helpful tips for you to get the most out of your deck all year round! Make sure that you’ve properly cleaned & prepared your deck for winter. Consider options like outdoor furniture covers, furniture that can withstand harsh weather, storing furniture in a shed, etc. so that you have comfortable, clean, dry seating. Heat lamps look great, and provide warmth to your outdoor sitting area. Fire pits, chimineas, etc. are great for evenings fireside. Evergreen plants look wonderful in all seasons and will add beautiful greenery to your winter deck landscaping. String lights, lanterns, and candles add warm cheer to any space–they’ll liven up your deck in winter and summer alike! Heated floors make snow cleanup a snap! Feel free to sit outside and watch snow pile up around you while you sip hot chocolate, and gleefully rejoice in the fact that you aren’t shoveling snow off your deck. Most importantly you’ll need lots of warm beverages, laughter, and love to make your winter deck experience complete. With a little creativity, you will be enjoying time on your deck in winter in no time at all! Remember, at Harmony Decking, we’re here to help you every step of the way. Whether you’re looking to build a new deck, modify an existing one, or simply make the most of your deck in all seasons, we offer professional, friendly service to get the job done right. Call Harmony Decking today! 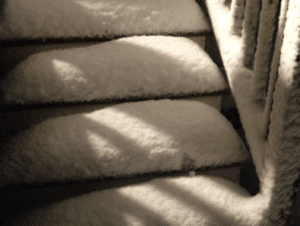 Winter brings cold, damp conditions that aren’t always enjoyable–especially for your home and deck. 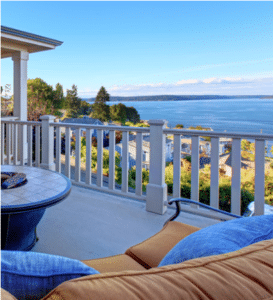 Prolonged exposure to the elements shortens the life of your deck and can lead to costly repairs or replacements; proper routine maintenance, however, can eliminate these problems. At Harmony Decking, we want to provide our valued customers with the knowledge and advice that will keep outdoor living spaces in excellent condition for many seasons to come. We’ve talked previously about fall deck maintenance and some helpful tips for decks in winter, and this blog will go into more detail about how to prepare your deck for winter. Read on for a few valuable tips on how to help your deck brave the cold winter months ahead! Spending just a couple hours of preventative maintenance in the fall can save you a great amount of time and money after a hard winter season. Take some steps before winter arrives to ensure that your deck is in tip-top shape for the cold. Look at your ledger board (this is where the deck attaches to the main structure of the house) to make sure that it is sound and that all fasteners are secure. Make sure all support posts and joists are structurally sound. Depending on your deck, this may mean getting on the ground or underneath to get a proper view. Drive in or tighten any nails or screws that may have worked themselves loose. Is water collecting in certain spots? If so, it’s a good idea to make repairs or add flashing in those areas. Make sure all handrails, railings, and stairs are secure with no loose parts. Consider adding abrasive strips to stairs or high-traffic areas, especially if there are young or elderly members in the household. If you haven’t sealed your deck within the last year, consider applying a water repellant; this will prevent slow water damage over time. Always follow manufacturer instructions when applying any type of seal! 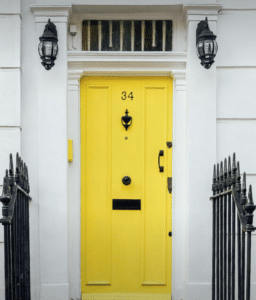 Front door – A uniquely colored door is definitely an eye-catching feature on any home. Is your current entryway a dismal brown or dull grey? Why not add a splash of color to help your house stand out? Opting for a cheerful shade of red or bright blue makes for a much more welcoming sight. For a fun project with the kids, you could also dress your door up with a homemade seasonal wreath that will delight and impress your guests. Furniture – Setting up a rocking chair or porch swing not only lends your home a cozier look, it provides a great little spot for relaxing and enjoying the fresh air. Add a small table to set mugs of cocoa and dog-eared books, and you’ve got yourself a front porch paradise. Fence decorations – It may not be Christmas quite yet, but that doesn’t mean you can’t string some beautiful lights on your porch fence! This serves the dual purpose of lighting the way for visitors and making your house a twinkling, cheerful sight. Festive garlands are a nice touch, too! Flora – This is a great time of year to get creative with porch décor: Think pots of mums in autumn hues, carved pumpkins, and gnarled, bumpy gourds. The fall season provides gorgeous natural inspiration that you can use to dress up the front of your home. 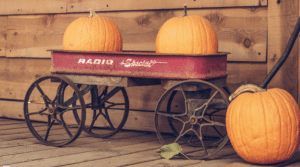 If you haven’t already, take a trip to the pumpkin patch and pick out a few beauties! 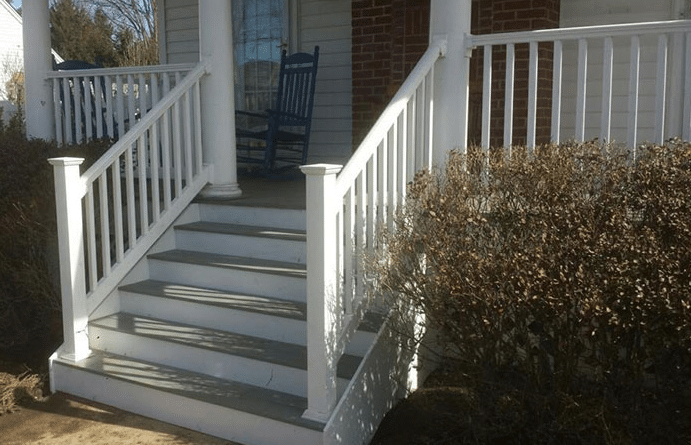 On a final note, make sure your front porch looks neat and well-maintained before you even begin with decorations; if it requires a fresh coat of paint or repairs to damaged areas, tackle those issues first. Don’t hesitate to contact Harmony Decking about deck or porch installation—we’d be happy to help create the outdoor living space you’ve been dreaming of!